Many of the best shenanigans happened in pit lane as teams were forced to wait in thirty-minute increments as Formula One reassessed the weather. Hours passed until it would have finally been too late to start, and that’s when F1 made the call to host qualifying this morning instead. 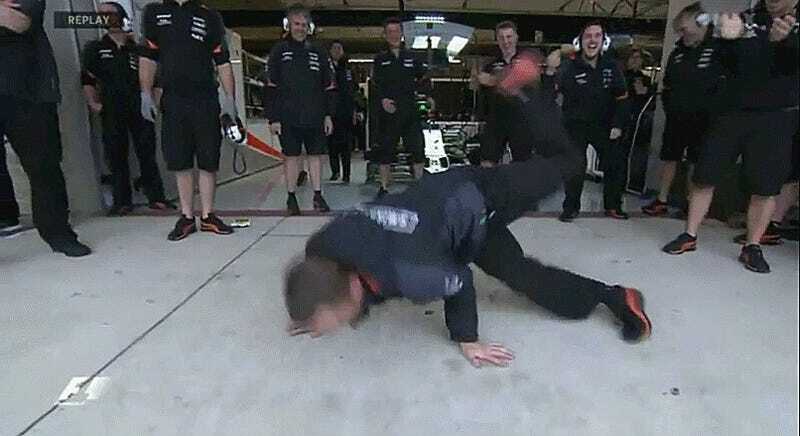 One Force India mechanic showed off some mad breakdancing skills. Red Bull drivers Daniel Ricciardo and Daniil Kvyat stuck to a more traditional form of dance. Red Bull also did a little bit of bowling in pit lane with some cans of their title sponsor’s product. Some of their parts also double as frisbees. Kvyat, however, may be better at dancing than he is at juggling. Plenty of teams had “boats” to float down the pit lane. Williams took a rowboat down the pits made out of several items from their garage. The Force India Bobsled Team was a highlight of the day as well. Fans in the main grandstand across from the pits went nuts every time a team would do something fun, so perhaps we encouraged them out of the woodwork. Formula One has a full run-down of the shenanigans that took place during yesterday’s neverending rain delay here, including a full Williams F1 Rowing Team and a birthday celebration in the Red Bull garage. My favorite instance of rain delay fun wasn’t from the teams per se—it’s this fan video from under the bridge next to the Turn 15 grandstands. I compared Free Practice 3’s conditions to a Slip ‘N’ Slide, but these fans decided to make this slippery hillside into one. Conditions were so bad that they even had a little pool of water at the bottom to slide into. Genius!